The SE’nSE Fund was set up in 2016 by Pierre Mottet and is hosted by Foundation for Future Generations. Its aim is contributing to a sustainable world by stimulating entrepreneurship. 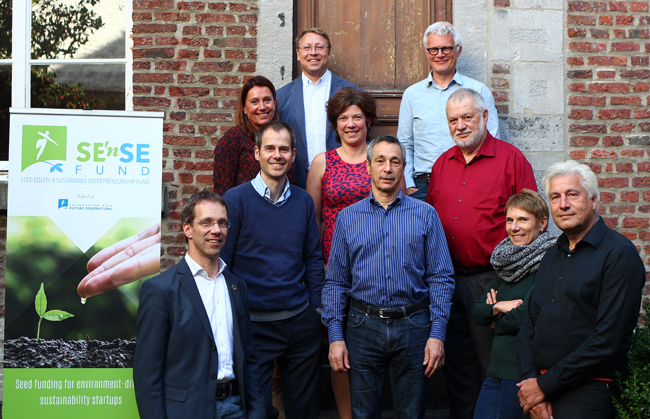 Thanks to an endowment of €100.000 yearly, mainly from its founder and supplemented by other philanthropists, the SE’nSE Fund succeeds in supporting start-ups with a significant positive impact on the environment. Next to financial means (seed equity) the Fund facilitates networking and experience exchange. The jury selects a maximum of six outstanding projects each year, based on their potential positive impact on the environment and their sustainable manner of working. Karen Boers, startup.be - Piet Colruyt, Impact Capital - Sabine Colson, Société Régionale d’Investissement de Wallonie (SRIW) - Christophe Guisset, Chroma Impact Investment - Yves Jongen, IBA - Pierre Mottet, IBA (Président du Jury) - Jérôme Partos, Eurasia Environmental Technologies - Julien Pestiaux, Climact - Hugo-Maria Schally, Commission Européenne, Direction générale pour l'Environnement - Sybille van den Hove, Bridging for Sustainability. The call for projects for the SE’nSE Fund 2018 is now closed! The call for applications is national and in English.